Xiaomi fans in India had to face some trouble with the flash sale strategy and many of them failed several times to grab Redmi Note 4G. But now there is an alternative way to buy Redmi Note 4G via an Indian Carrier. Tired of flash sales on Flipkart and failed to grab the Xiaomi Redmi Note 4G? Now, Airtel has come up with a great alternative which will make hassles disappear. 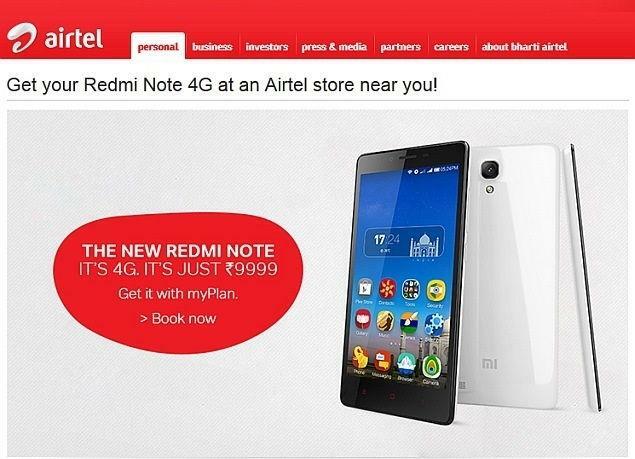 Airtel will be selling the Redmi Note 4G at the same price it is available via Flipkart, Rs. 9,999. This is one of the best reasons why you should buy the phone from Airtel. The Redmi Note 4G will be available via 133 Airtel stores across six cities – Bengaluru, Hyderabad, Chennai, Mumbai, Delhi-NCR, and Kolkata. Users have to book the handset from the dedicated Mi page from Airtel, and will have to select their preferred city and store from where they will pick up the phone. Users can pay using their credit or debit card or can even pay cash while receiving the phone from their preferred Airtel store. Also, Airtel has planned to start one Mi Day on which users can just walk into the store and buy Redmi Note 4G without any registration. Though it is mandatory of Airtel Prepaid and non-Airtel customers to opt for the Airtel myPlan before buying Redmi Note 4G, also postpaid customers having a minimum 500 MB data activated will not have to opt for any other data plans. The customers will be upgraded to 4G from 3G in the six cities, and as the 4G service starts in their cities they can enjoy the 4G speed paying for the same 3G data plan. And customers in Bangalore, where Airtel has 4G network can get 10GB free 4G data by logging into Airtel website from the Redmi Note 4G handsets.